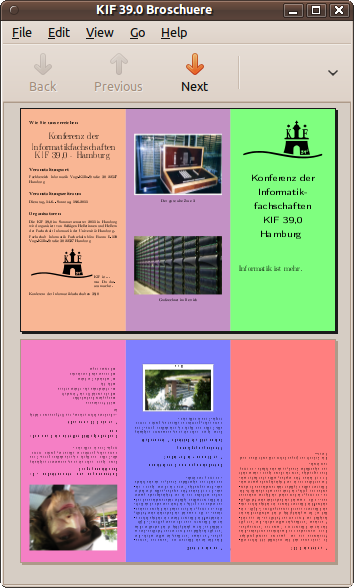 I was playing around with the LaTeX’s leaflet class to produce brochures, leaflets or flyers, however you’d like to call them. Basically a DIN A4 in portrait mode and three “columns” which I wanted to feel like pages. The backside needs to be upside down and the “pages” need to be properly ordered in order for the whole thing to be printed and folded properly. 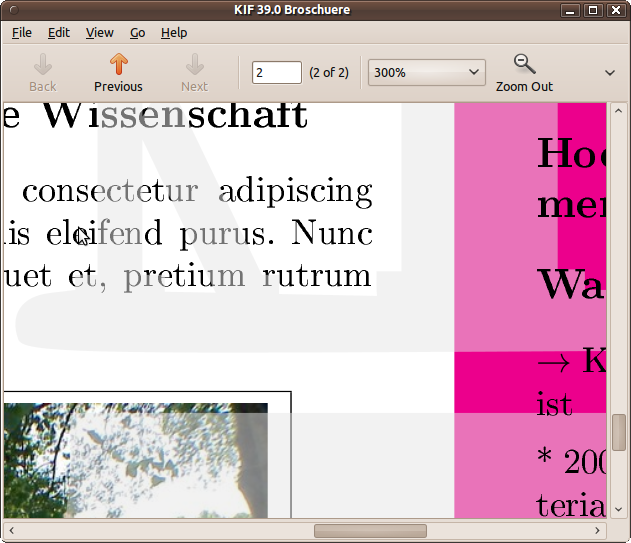 So I had a look at the manual and noticed, that it uses background colour for pages. I wanted that, too. As the manual reads, you can use \AddToBackground to add stuff to the background. But what is to add if you want a page to have background colour? Well, Wikibooks says to use \pagecolor. But that colours the whole DIN A4 paper and not just one virtual page in a column on the DIN A4 sheet. I browsed around and didn’t find any real explanation but an example. At least the code uses different colours for different virtual pages and it just works. Nice. 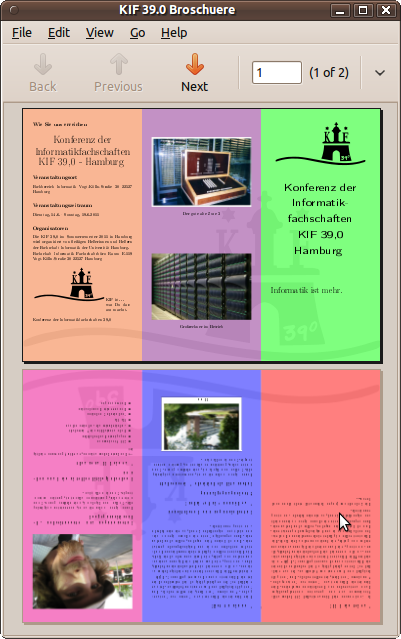 It doesn’t seem to be possible to have coloured virtual pages *and* a background picture spanning over the whole DIN A4 page. I tried several things, including playing around with the wallpaper package, but I didn’t have any success so far. One could split the background up in three pieces and include one of those on each page, but that’s really ugly and hacky. I don’t like that. I kinda got it working using eso-pic and transparent, but the result is messy, because the image, which is supposed to be in the background, is in foreground. And even with transparency, it looks bad. Just like a stamp, not a watermark. # Doesn't work with pdftk 1.41, but with pdftk 1.44. But I wasn't quite happy having to use external tools. I want my LaTeX to do as much as possible to not have to rely on external circumstances. Also, my Fedora doesn't ship a pdftk version that is able to do the multibackground. So I had another look and by now it is almost obvious. Just put the background picture at (0,0), and *then* draw the background. Note that virtual pages 2 and 5 make the first column on a physical page. Hence, we draw the background picture there and scale it by three, to make it spawn across the physical page. 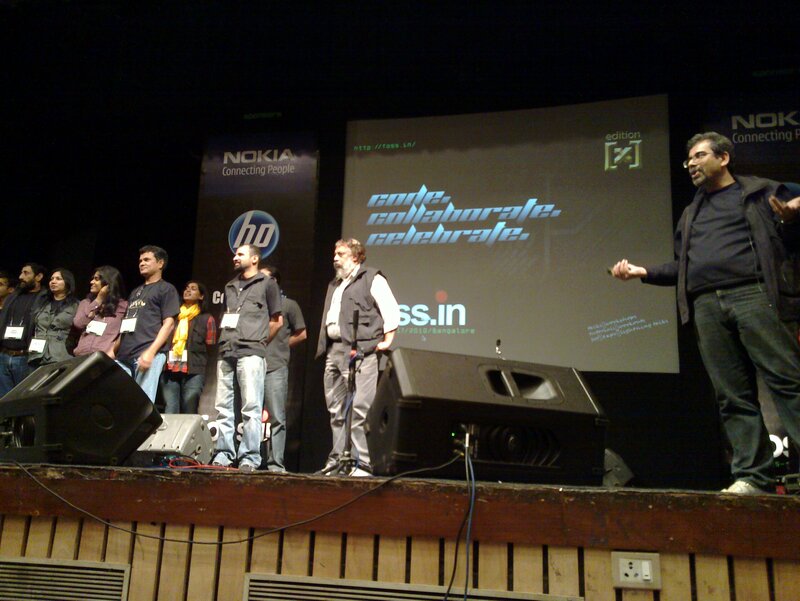 I had the pleasure to be invited to FOSS.in 2010. 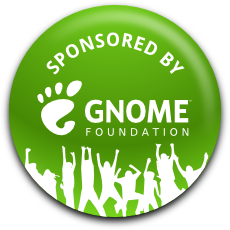 As I was there to represent parts of GNOME I feel obliged to report what actually happened. The first day was really interesting. It was very nice to see that many people having a real interest in Free Software. It was mostly students that I have talked to and they said that Free Software was by far not an issue at colleges in India. Many people queued up to register for the conference. That’s very good to see. Apparently, around 500 people showed up to share the Free Software love. 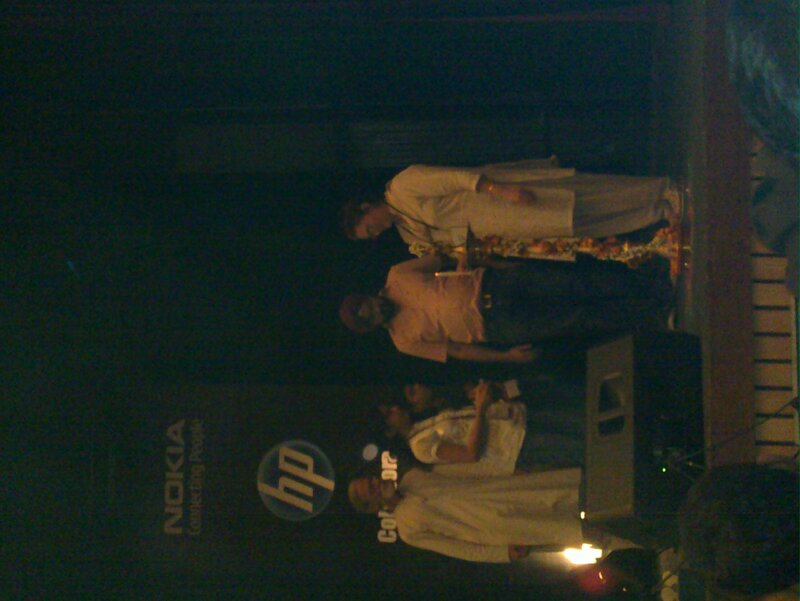 the usual delays in the conference setup were there as expected So the opening ceremony started quite late and started, as usual, with lighting the lamp. Danese from the Wikimedia Foundation started the conference with her keynote on the technical aspects of Wikipedia. She showed that there is a lot of potential for Wikipedia in India, because so far, there was a technical language barrier in Wikipedia’s software. Also, companies like Microsoft have spent loads of time and money on wiping out a free (software) culture, hence not so many Indians got the idea of free software or free content and were simply not aware of the free availability of Wikipedia. According to Danese, Wikipedia is the Top 5 website after companies like Google or Facebook. And compared to the other top websites, the Wikimedia Foundation has by far the least employees. It’s around 50, compared to the multiple tens of thousands of employees that the other companies employ. She also described the openness of Wikipedia in almost every aspect. Even the NOC is quite open to the outside world, you can supposedly see the network status. Also, all the documentation is on the web about all the internal process so that you could learn a lot about the Foundation a lot if you wanted to. She presented us several methods and technologies which help them to scale the way the Wikipedia does, as well as some very nerdy details like the Squid proxy setup or customisations they made to MySQL. They are also working on offline delivery methods because many people on the world do not have continuous internet access which makes browsing the web pretty hard. 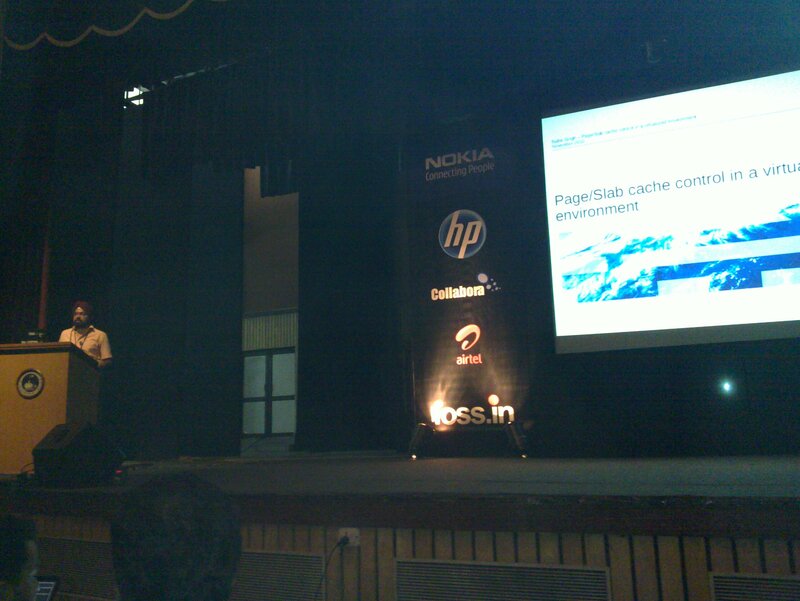 After lunch break, Bablir Singh told us about caching in virtualised environments. He introduced into a range of problems that come with virtualisation. For example the lack of memory and that all the assumption of caches that Linux makes were broken when virtualising. Basically the problem was that if a Linux guest runs on a Linux host, both of them would cache, say, the hard disk. This is, of course, not necessary and he proposed two strategies to mitigate that problem. One of them was to use a memory balloon driver and give the kernel a hint that the for the caching allocated pages should be wiped earlier. Lenny then talked about systemd and claimed that it was Socket Based Activation that made it so damn fast. It was inspired by Apples launchd and performs quite well. Afterwards, I have been to the Meego room where they gave away t-shirts and Rubix-cubes. I was told a technique on how to solve the Rubix-cube and I tried to do it. I wasn’t too successful though but it’s still very interesting. I can’t recite the methods and ways to solve the cube but there are tutorials on the internet. 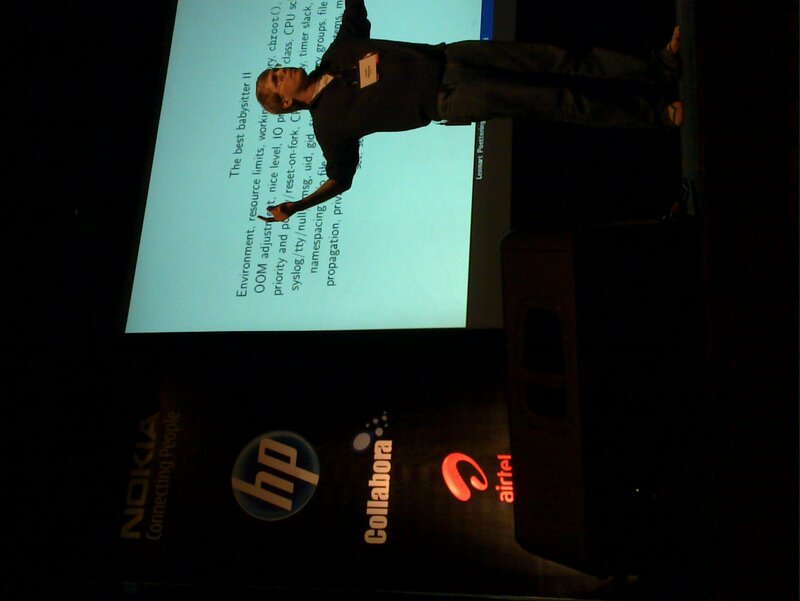 Rahul talked about failures he seen in Fedora. He claimed that Fedora was the first project to adopt a six month release cycle. He questioned whether six month is actually a good time frame. Also the governance modalities were questioned. The veto right in the Fedora Board was prone to misuse. Early websites were ugly and not very inviting. By now, the website is more appealing and should invite the audience to contribute. MoinMoin was accused of not being as good MediaWiki, simply because Wikipedia uses MediaWiki. Not a very good reasoning in my opinion. 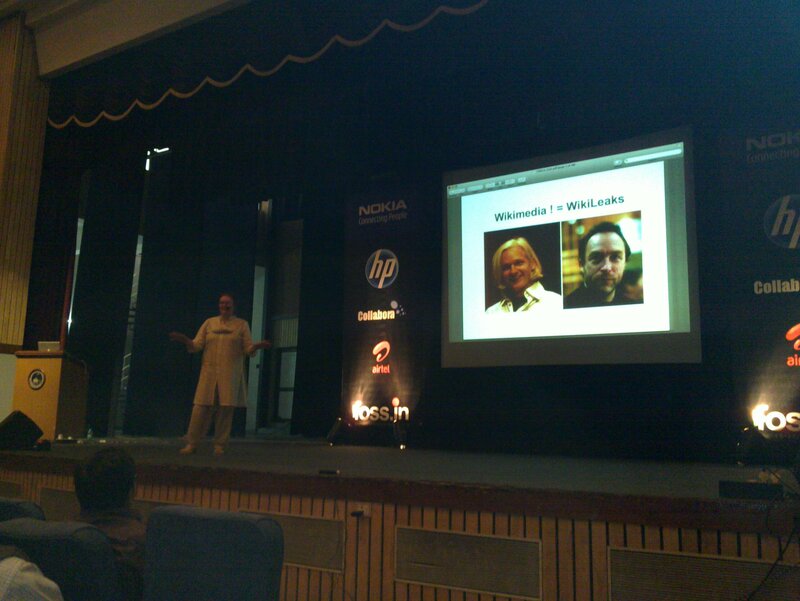 I was invited to do a talk about Security and Mobile Devices (again). I had a very interested audience which pulled off an interesting Q&A Session. People still come with questions and ideas. I just love that. You can find the slides here. But more on that in a separate post. Unfortunately, the FOSS.in team announced, that this will be the last FOSS.in they organise. That’s very sad because it was a lot of fun with a very interesting set of people. They claim that they are burnt out and that if one person is missing, nothing will work, because everyone knew exactly what role to take and what to do. I don’t really like this reasoning, because it reveals that the Busfactor is extremely low. This, however, should be one of the main concerns when doing community work. Hence, the team is to blame for having taken care of increasing the Busfactor and thus leading FOSS.in to a dead end. Very sad. But thanks anyway for the last FOSS.in. I am very proud of having attended it.